As a superior alternative to traditional dentures, All-on-4 Treatment is a revolutionary procedure where your teeth are replaced with an implant-sustained-denture (full set of teeth) in a same-day procedure. 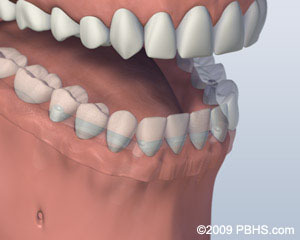 A full-arch prosthesis is attached to the jaw by four dental implants, as a permanent solution to your missing teeth. Your new full set of teeth will look, feel, and function naturally, eliminating the hassle, embarrassment, and dietary restrictions of traditional dentures. Performed for over 20 years on thousands of patients, All-on-4 Treatment is a trusted and time-efficient procedure to ensure you can eat, smile, and laugh without constraint. Gone are the days of dentures as the sole option for patients who are missing many teeth. 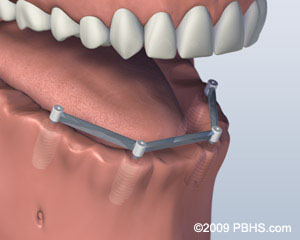 Now, we are able to give patients a fixed, full-arch prosthesis that is attached to only four implants the same day as surgery, thereby eliminating the hassle, embarrassment, and dietary restrictions of traditional dentures. Our goal is to improve the quality of life of our patients, and All-on-4® treatment concept makes that almost instantly possible. While dentures must be removed for daily cleaning and replaced or regularly reshaped, All-on-4® treatment concept is a permanent solution that ensures patients can eat, smile and laugh without constraint. We are restoring smiles in record time and changing lives every day with All-on-4 Treatment. We encourage you to call our friendly team at Milwaukee Office Phone Number 414-257-1161 to get started on your journey to restored oral health today!